I am on the St. Joe River in Idaho’s Panhandle. Giant Western red cedar trees tower above me. Their shaggy bark forms in vertical lines and the scale-like leaves (reminiscent of junipers) form attractive sprays. Long, light green lichens dangle from their branches like scraggly beards, creating a ghostly atmosphere. Ferns and yews grow around their bases and thick green mosses coat the rocks. The forest around me is an almost impenetrable jungle. Undergrowth is thick and dense and yellow pines, larches, hemlocks, and grand firs join with the cedars to create a canopy that seems to almost blot out the sun. This place is hardly recognizable as the Idaho I know, with wide open high desert and lodgepole pine and Douglas fir forests. How can two areas have such differing vegetation? Why do cedars grow in North Idaho, but not along the South Fork of the Snake River? Plant communities are simply the expression of a complex orchestration of largely abiotic factors and conditions. Some of the most significant factors that determine what grows where include: soils, temperature, latitude, elevation, aspect, topography, moisture, sunshine and time. What works at the seashore won’t grow at timberline. Distinctive communities evolved to fit the specific environment at each site. For instance, on the St. Joe, the climate is described as maritime. Winters are mild and the climate is cool and moist overall. Elevations range from 1200 to 7000 feet and 49-80 inches of annual precipitation fall. Compare that to the South Fork of the Snake River where elevations range from 4400 to 9900 feet, winters are harsh and yet only 16-40 inches of annual precipitation fall. High, cold, and dry seem to characterize the South Fork, especially when compared to the St. Joe. No wonder plant communities are different. Soils play a critical role in determining what grows where. Many plants are highly sensitive to soil type, thriving only in specific conditions. A good example of this comes from the St. Joe. To rid roadsides of an invasive daisy without herbicides, the Forest Service altered soil conditions by adding fertilizer. The daises thrive in nutrient poor soils and the fertilizer created a condition that the daisy could not tolerate. Few daises can be found along the roads now. How long geologic processes such as wind and water erosion and glaciation have had to work on the land also plays a role in plant communities. The St. Joe lies within an area about 500 million years old. The South Fork is less than 250 million years old. Time has had much longer to build soils and finesse plant communities on the St. Joe. Conditions can also change over time. 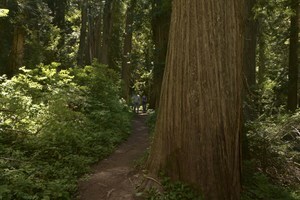 Several million years ago, Yellowstone’s environment favored redwood trees. The situation changed and the redwood forests are gone, but they left behind petrified monuments. The South Fork isn’t the St. Joe, the Sand Creek desert will never be like the Black Hills of South Dakota. Each environment creates its own signature plant communities and that huge diversity has created the bountiful world we know today. You won’t find the same plant communities in North Idaho that you see in Eastern Idaho. Environmental conditions are different so the plants are different.